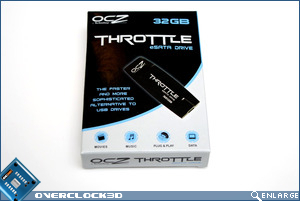 Given OCZ's track record for the packaging of their DDR Memory and USB Flash Drive products, I would have bet money on the Throttle being presented inside a clear plastic vacuum formed packet. 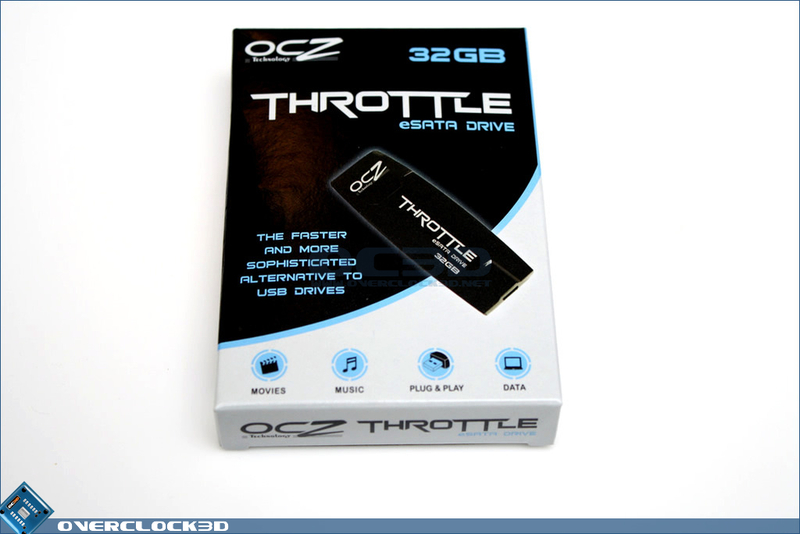 However, in a break from the norm it would seem that OCZ have upgraded the packaging to something a little more substantial (and maybe even eco friendly) with a cardboard box just slightly larger than a deck of cards. 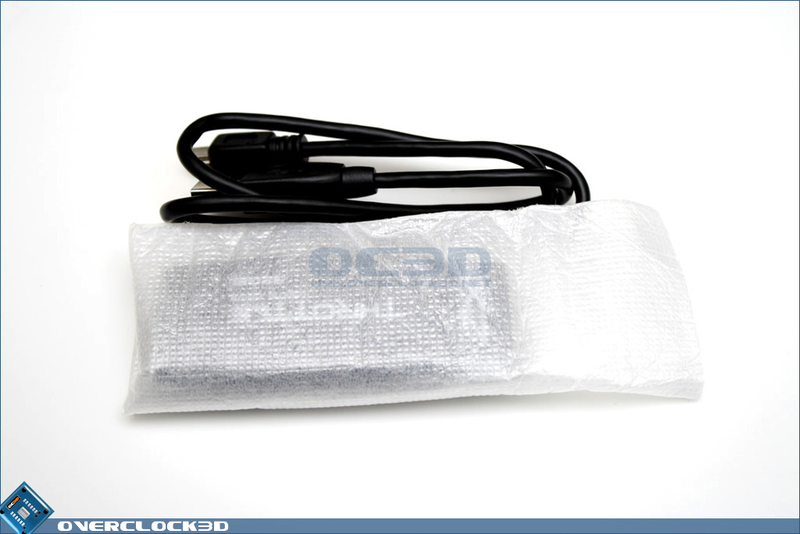 The design on the box is quite minimalistic with White, Blue and Black being the only colours used. 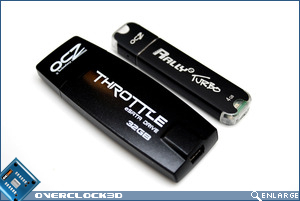 At the front of the box is an image of the Throttle along with some basic information and a tagline: "The faster and more sophisticated alternative to USB drives". 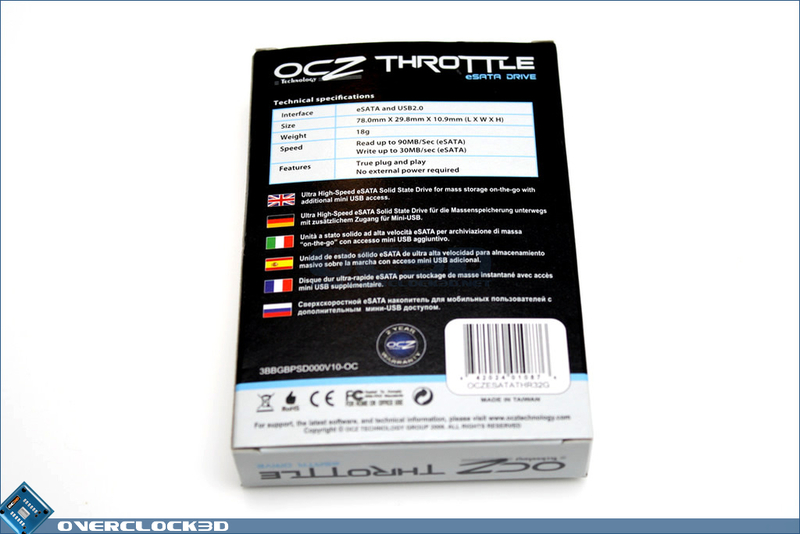 Moving round to the back of the box, a specifications chart details the size, weight and performance figures of the Throttle along with a short description of the drive in six different languages. 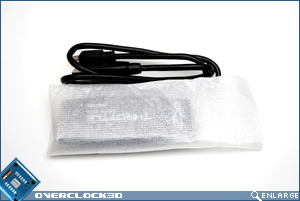 Inside the box you will find the Throttle wrapped up inside a paper sleeve to prevent scratching during transit and a separate Mini-USB to USB cable. 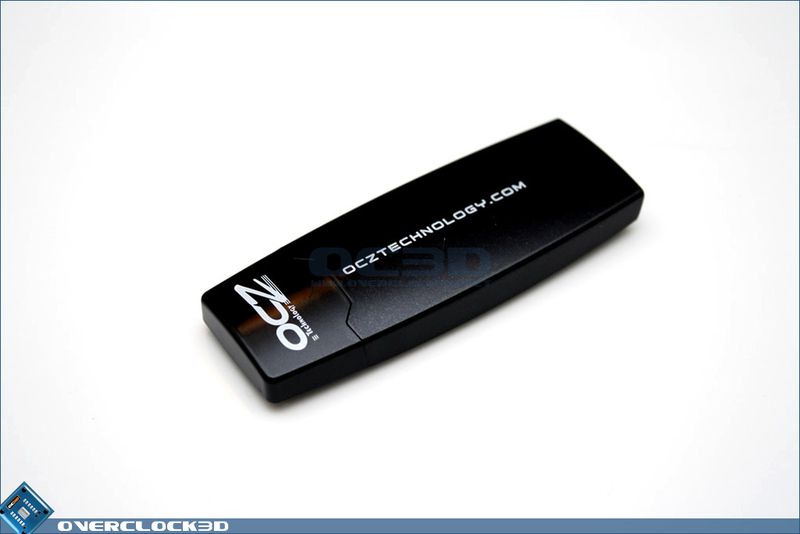 This bare essentials approach to Flash Drives is quite common in all honesty, but it certainly wouldn't have hurt OCZ to include some kind of lanyard or keyring for those who intend on carrying the Throttle around with them. 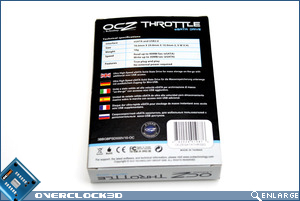 The Throttle is constructed from highly polished black plastic which does admittedly pick up scratches quite easy. 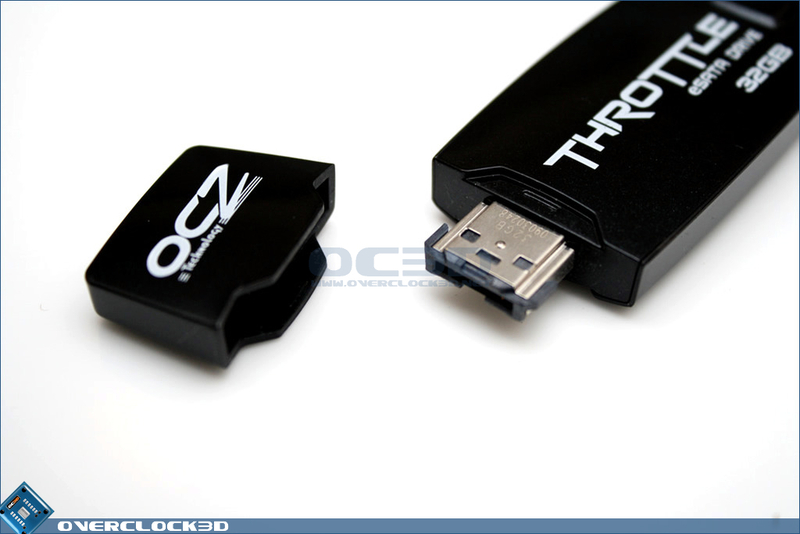 Placing the Throttle side-by-side with one of OCZ's high performance USB based drives (Rally2 Turbo) we can also see quite a difference in size between the two drives, with the Throttle coming in at around twice the width and a few centimetres in length. 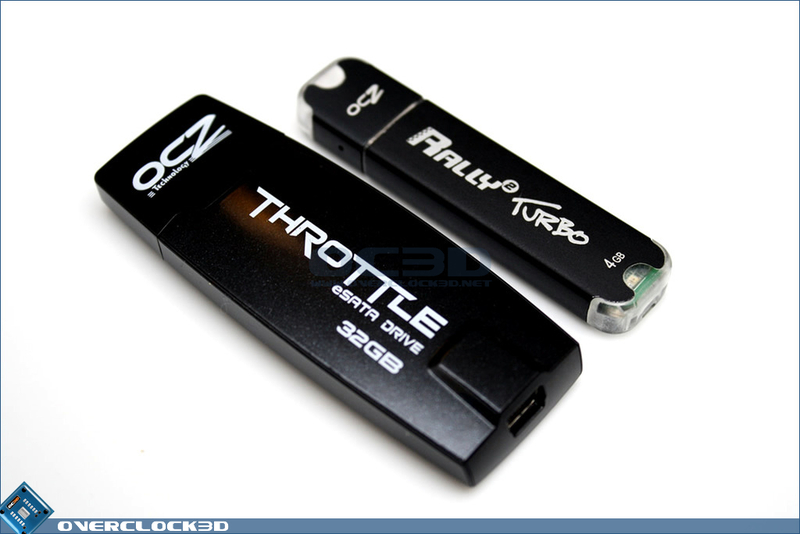 Of course, what the Throttle looses in its slightly chubby appearance, it more than makes up for in its physical capacity - boasting 8x more storage than the 4GB Rally2 Turbo. 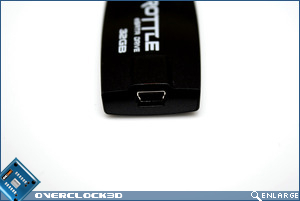 Removal of the plastic cap is extremely easy (maybe too much so) and reveals the eSATA connector hidden beneath. 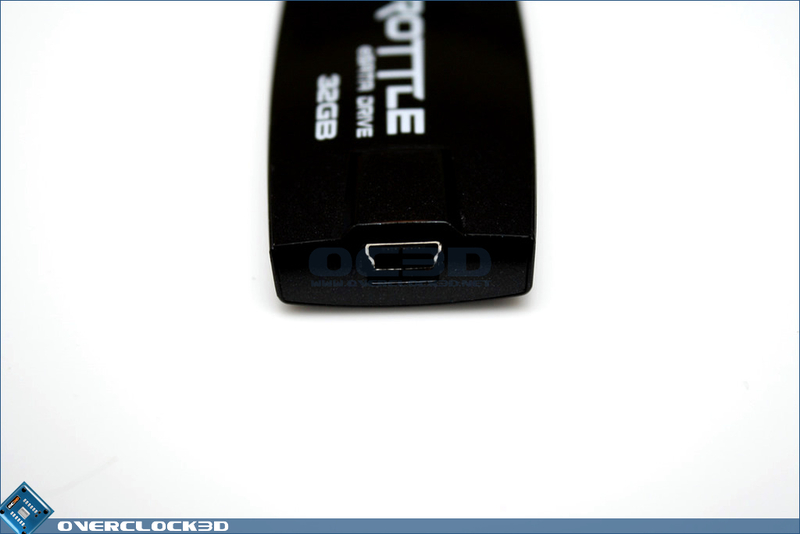 To put things into context for those who haven't as yet come into contact with an eSATA device, the plug is almost exactly the same width as a USB connector and only ever so slightly thinner. 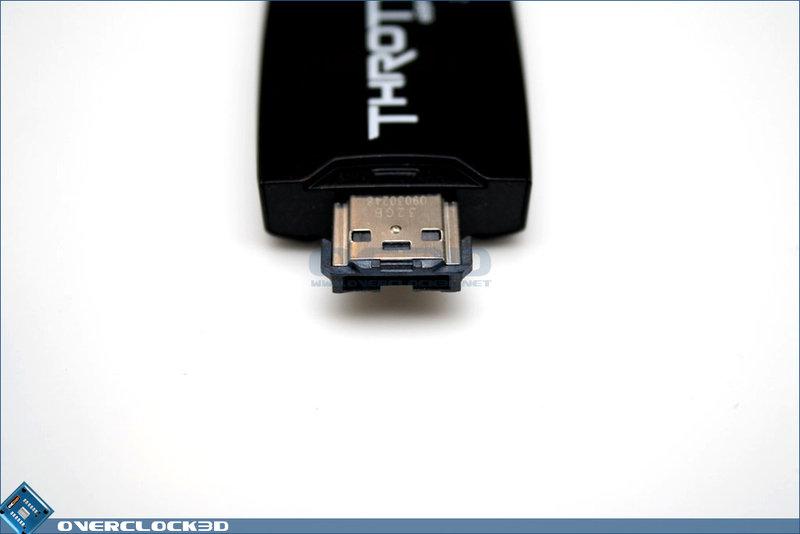 One big disadvantage to eSATA aside from the lack of wide-spread uptake so far is the fact that it is unpowered on almost all PC's and Laptops. 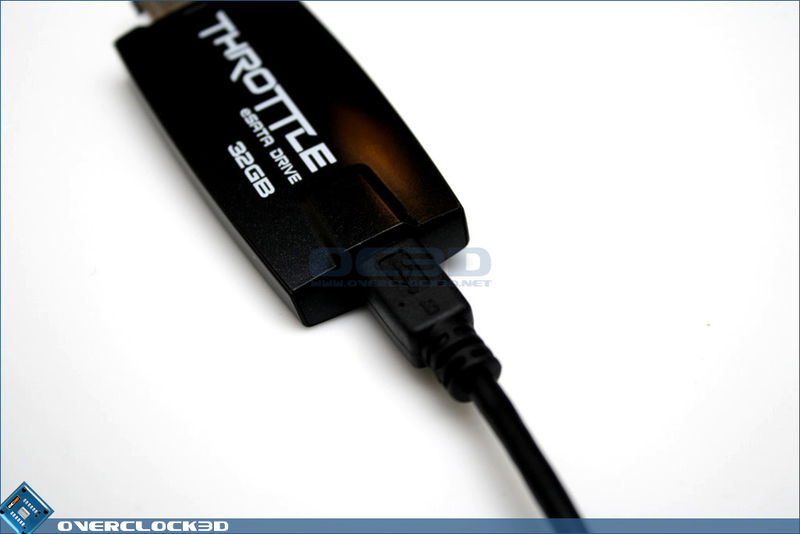 This means that in order to run any eSATA devices you must have an external power source. 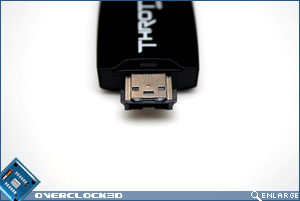 Some motherboard manufacturers - most notably MSI have adapted the eSATA standard to deliver power via the ports on their latest boards, but for those with unpowered ports the Throttle can get its power from USB using the provided cable. 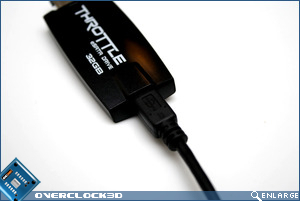 Additionally the Throttle can run entirely from USB if required. Wow that was a good read. Nice review mate.. Impressive stuff on the speeds. Only thing I could think of throughout though was what's the point in it really with USB 3 (like you mentioned) on the way. Was about to question your maths on the but then had a lil look around and realised it's correct. Yeah I had to double check that myself too! I installed Win 7 from a USB stick onto my NC20 as I don't have an external drive. Was a right pain in the arse getting the thing bootable!! So you're saying that with this you shouldn't have that trouble?